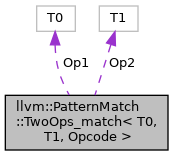 Matches instructions with Opcode and three operands. Definition at line 1043 of file PatternMatch.h. Definition at line 1047 of file PatternMatch.h. Definition at line 1049 of file PatternMatch.h. Definition at line 1044 of file PatternMatch.h. Definition at line 1045 of file PatternMatch.h.